Discussion in 'Canon InkJet Printers' started by palombian, Dec 6, 2018. 1. octoinkjet.co.uk (a forum member): I started with their inks, at that moment the same as PC. Best inks IMO, good service and price. Since I am low on Y and MBK I will order some here (before the Brexit spoils this too). Sells also a V2 set, with PM, M, GY (grey), G(green) and R as "new" colors, while with Precision Colors PM, M, GY(grey), C and R are a new formula. Maybe not exactly the same inks ? 2. octopus-office.de: I am very satisfied with their MAXIFY inks (and since I refill OEM carts as suggested by them since the beginning ) I have zero issues with this printer (fingers crossed). But I once ordered grey since the original US/UK lacked gloss and had adhesion problems, but this was worse. They are quite expensive too for PGI-9 (no more big bottles). 3. eBay: several suppliers proclaiming their inks do not ruin your printhead. An essential requirement for 3th party ink, so I do not expect much from the other qualities of their ink. One I eventually would consider is topink24.de (no experience). For a number of years I’ve been buying ink from German manufacturer Arici (www.druckerpatronentankstellen.de ). If you want low cost at a reasonable quality they’re a good alternative but only for some models of printers. I.e. for Canon Pro9500/Pro10 series they sell only dye ink, which probably performs OK. colorwise, but fading performance will be poor, as all third party dye inks. Likewise, I can say that their dye inks for Pixmas IP3xxx/4xxx are free from problems of clogs or anything and the colors, with a custom profile, are very good although, unsurprisingly, fading endurance is nothing to write home about, if the prints are exposed to daylight/ozone. 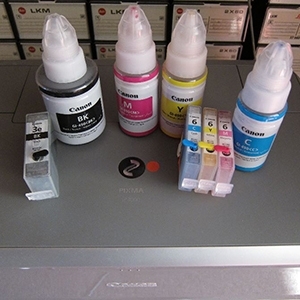 Their pigment black inks for Canon BCI3-ebk and PGI-5 carts. have an excellent relationship price/performance. One liter is only €15 or so. Surely there’re better inks in Europe but at much higher price. In short: for low cost everyday black text printing I can recommend Arici. For color prints protected from external agents, they’re quite good too. If you need quality and longevity as close as possible to OEM ink, then look elsewhere. I have no experience of their inks for Canon Prograf models or other brands like Epson/HP etc.. but I guess it will be on the same line. -Concerning Brexit, maybe it won’t be so bad for us in continental Europe. Right now, Octoink charges the VAT to private customers in their invoices. AFAIK, after Brexit is effective they won’t charge it to customers outside the UK but, of course, you’ll have to pay the VAT of your country as part of the Customs fees. Bad news is that those Customs charges will include also the handling fees (DUA) which we don’t pay now. Down here, this is an amount of 18-€22. For an order of €200 we’ll pay an extra 10% but if the order is for €50 we’ll pay 40% extra. Therefore, to minimize the proportional impact of the handling fees in the total cost, instead of making small orders every three months, I'll make a bigger order once a year. Ink stained Fingers and palombian like this. Thanks for the info, @Artur5. Indeed, I did not found reliable sources for PGI-9 inks in Germany - except maybe octopus-office.de - (although I finish now the 500ml bottle MBK I bought from Prodinks years ago - except for the M an R with colors far off all others clogged ). I replenished yesterday at octoinkjet.co.uk (€ 38.50 for 2x125ml incl shipping). I keep a minimum stock of 100ml per colour, on average for 2 years printing. Maybe then I'll be out of PRO 9500 printheads (I have one new from this year, another in a spare printer, a third new in box). Instead of worrying, I better enjoy printing with what I have (all costs paid) and look for a replacement printer when the problem arises. I got a delivery from them via the U.S. Postal service, but I cannot judge the quality of these Canon inks. Or you may try marrutt.co.uk as another U.K. supplier . They are quite expensive too for PGI-9 (no more big bottles). The Canon iPro Graf range are the same inks that are used in the Pro 9500, so when looking for ink from a 3rd party supplier, they may sell bigger bottes for these printers, some of my pigment inks are 4 years old plus and working just fine, I’ve never had a problem storing 250 ml bottles of old ink..
"A US company, we don’t divulge sources thank you"
Yes, some of them even post here. I considered this some years ago (when PC considered to stop sending overseas the first time and octoinkjet was struggling with his suppliers), but new OEM cartridges are still expensive, although less per ml than PGI-9, and expired ones are difficult to find in Europe. I never had any issue with old pigment ink either. Large bottles of 3th party ink risk to survive me, considering I printed 4 years with 500ml matte black (mostly for office). I'll have to print more . stratman and palombian like this.